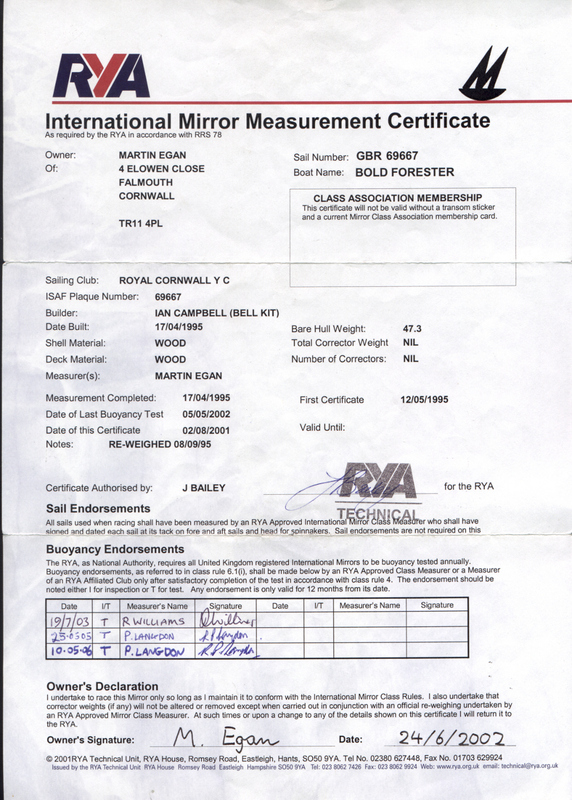 For Mirror dinghies this means you have to have a measurement certificate with the correct owner's details on it. You also need to have sails that carry a certification mark and the boat's buoyancy needs to have been checked within the last 12 months. The first thing to do is look to see if there is a certiticate in with any paperwork associated with the boat. 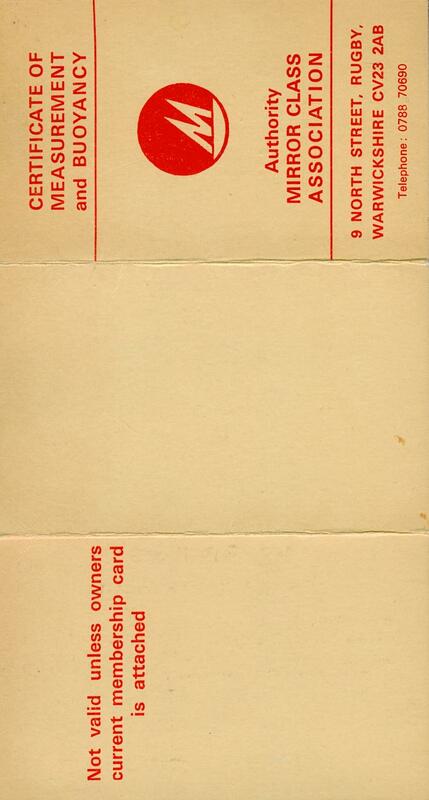 At first these were issued by the UK Mirror Class Association and were folded cardboard looking like this. When the class gained International Status in 1990 the International Yacht Racing Union (IYRU, later ISAF, now World Sailing) took over issuing certificates (? I think). These were printed on blue paper. I'm afraid I've not got a picture of one I can show you. More recently this task has been taken on by the National Authority in each country where Mirrors are sailed, so for us in the UK that means the Royal Yaching Association. These were also paper. Their appearance has changed over the years, here is one from 1995 and another from 2001. 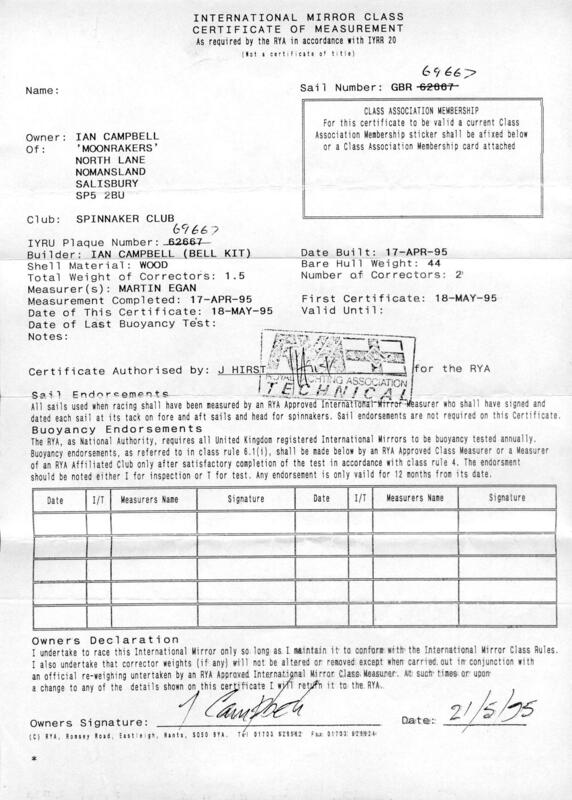 If there is a previous certificate then you just need to send it to the Technical Department of the RYA together with the current owners details, in particular their name, address, sailing club (optional), boat name (optional) and the RYA certification fee (or you can pay with a card over the phone). The RYA will transfer the date of the last buoyancy test from the old certificate and put it on the new one, so it's always worth sending in the old one if you have it. If there is no old certificate with the boat, the next step is to check with the Technical Department of the RYA to see if they have issued a certificate for the boat in the past. If so, they will issue a new one on receipt of the current owners details, sailing club (optional), boat name (optional) and the RYA certification fee. If you had a certificate, but have lost it, the RYA will issue a copy on receipt of the RYA certification fee. 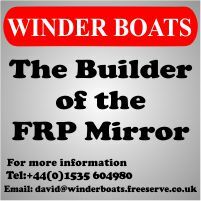 If not, and your boat has a sail number below 69070, then it's possible that the UK Mirror Class Association has issued a certificate. This would have been prior to 1990 when the IYRU/ISAF and then the RYA took over this task. The MCA used a card index system to record which boats had been measured and owners details. Here is an example. Sadly the Class Association had to dispose of this index - it took up a lot of space and nobody, including the National Maritime Museum Cornwall, was prepared to store it. 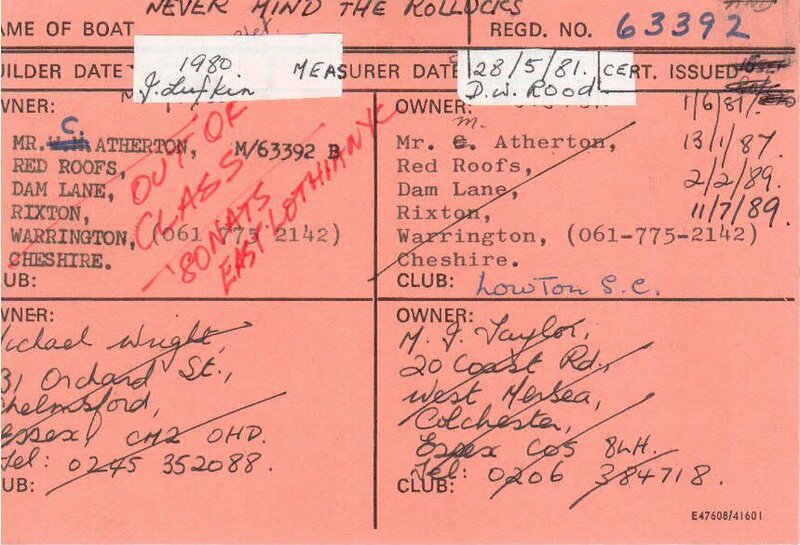 The Class Historian, Tim Cushion has kept a small number of cards, so if your boat is very old, you might be lucky. Contact Tim and ask him to send you a scan of the card for your boat. If the card says the boat has been measured, then the RYA will issue a certificate on the strengh of the measurement recorded on the card. 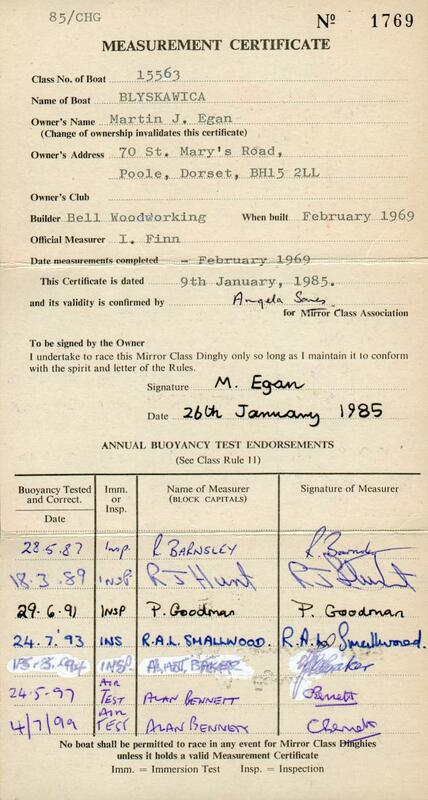 Send the scan of the card to the RYA Technical department together with current owners details and certification fee as you would if you had an old certificate (above). 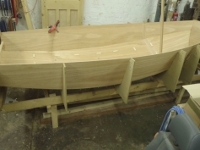 If there is no old certificate, and no evidence of previous measurement then you need to contact a Full Mirror Measurer and arrange for the hull, spars and foils to be measured from scratch. Join the UK Mirror Class Association, if you are not already a member, see our membership page. Make sure sails used for racing are certified (measured). Make sure the hull has undergone a buoyancy test in the last 12 months. Only make modifications and changes permitted by the class rules.